Omaha Tennis Buddies Awarded National USTA Community Community Service Award! The USTA announced that Omaha Tennis Buddies of Omaha, Neb., has been awarded the 2013 USTA National Adaptive Tennis Community Service Award. 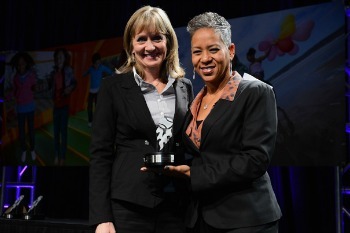 The organization was honored during the annual USTA Tennis Development Workshop (TDW) held Oct. 31 – Nov. 3, 2013 at the Sheraton Denver Downtown, in Denver. The USTA bestows this recognition upon a program or program leader that has demonstrated continued excellence, dedication and service in tennis for an adaptive tennis community. Established in 2005, Omaha Tennis Buddies is a program that provides year-round training opportunities for tennis athletes with developmental and physical disabilities. The program was built upon the summer program established by Special Olympics of Nebraska. With the help of the Omaha tennis community, Tennis Buddies provides additional training and resources throughout the year, fostering competitive tennis opportunities, friendships and social networks for players of all ages with special needs. In 2011-12, Tennis Buddies experienced tremendous growth. As a result, two new locations were added: Kansas City Buddies and Fremont Tennis Buddies. These two groups joined the Omaha and Lincoln Chapters of Tennis Buddies in providing tennis opportunities to athletes with special needs. Tennis Buddies includes not only on-court activities for the athletes but also various social and competitive events as well. The program also makes sure family members of the athletes are included in all competitive and social events. The Omaha Tennis Buddies train throughout the year both on and off of the court. In the winter, its players train at The Tennis Club. In the summer, tennis practices are held at Westside High School. Along with other volunteers, the Creighton University men's and women's teams work out with the Tennis Buddies. Tennis Buddies is fully supported by grants and donations. The program is free of charge and the instructors and coaches are volunteers. For more information on Omaha Tennis Buddies, visit their website at www.tennisbuddiesrock.com.